TS.674 "The Canadian" C.P.R. Diesel Passenger Set or CP Passenger "Canadian"
The issued set was composed of the R.55 CP Diesel Locomotive, R.443 CP Diner, R.442 CP Baggage/Kitchen Car, R.440 CP Coach and R441 CP Observation Car (all in 'silver-grey & maroon’ livery), Model 2200 Transformer and R.167 Track Pack. The retail price was $40.00 each. In 1967, a little over 1,000 boxed examples of each coach were sent out to Canada. This first production batch of Canadian Pacific passenger stock had yellow lines above and below the window panels on each side. In 1968, a second production batch of coaches was made. From this date the yellow lining to the coach sides was discontinued. 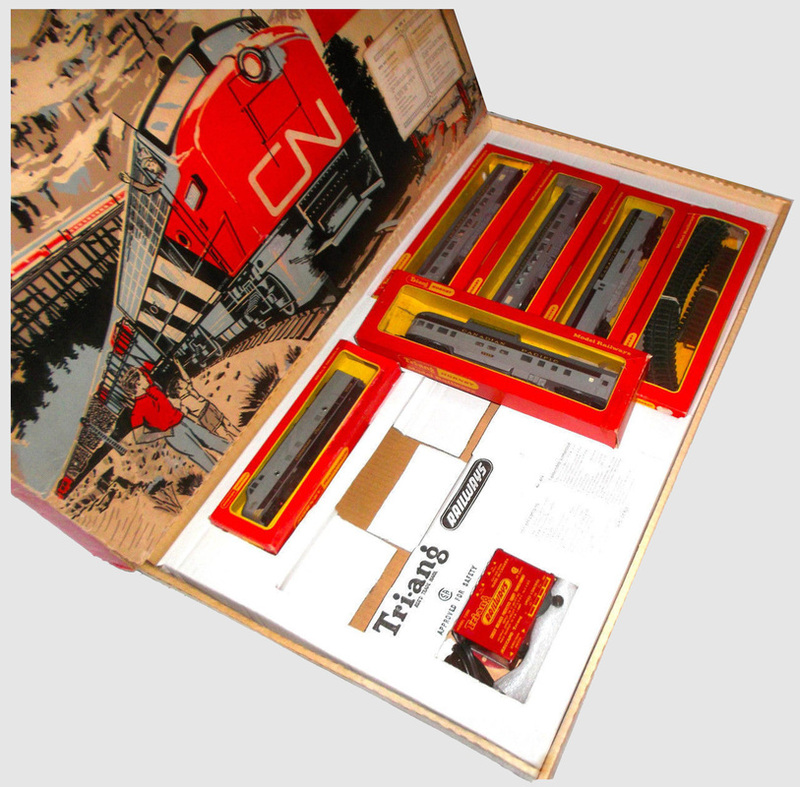 They were available individually boxed but 1,000 of each coach were bulk packed for Canada to be used in the TS.674 Set. This second production batch is found exclusively in the 1968 style boxes. The 1968 version of Set TS.674 is the most commonly found of the surviving sets from this period. or Steam Passenger "Davy Crockett"
The set was composed of R.358S 'Davy Crockett' Steam Locomotive with Smoke, R.233 Tender, 2x R.448 Old Time Coach and R.449 Old Time Caboose, Model 2200 Transformer and R.167 Track Pack. Production numbers are not known but the sets were priced at $45.00 each. 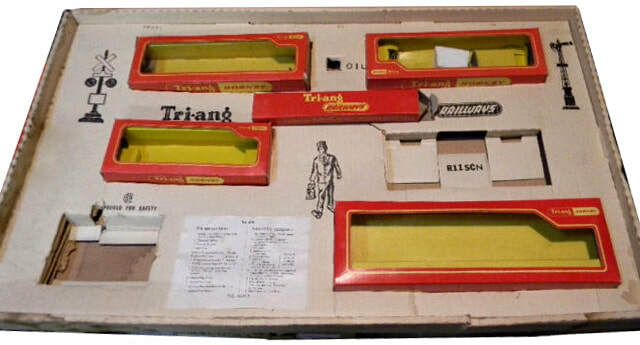 The set only appeared in the 1967 style packaging. The set was reissued in 1971 as Set No. 675 ‘Davy Crockett’. It was not illustrated in the 1971 Catalogue but featured in that year’s price list. It is assumed that the later issue Model 1000 Transformer Control Unit and the new System 6 track were included in that set. 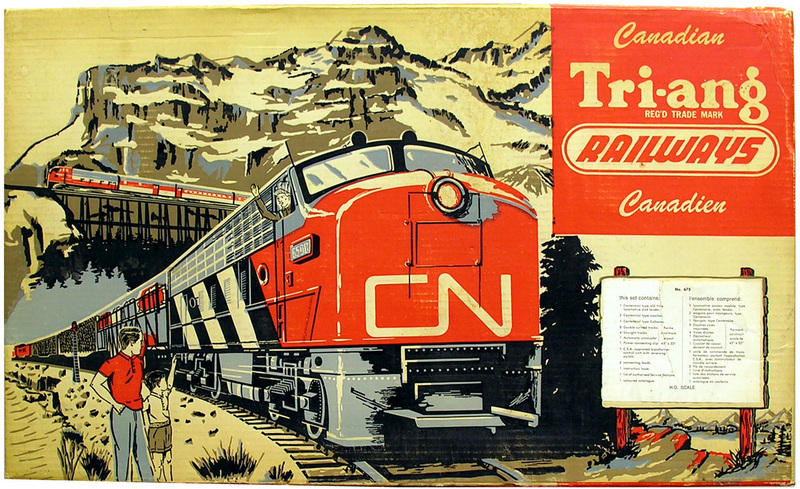 or CN Freight Set "Industrialist"
The set was composed of the R.55 CN Diesel Locomotive, R.247 Murgatroyd’s Chlorine Tank Car, R.349 red ICI Caustic Tank Car and R.115 CN Caboose, Model 2200 Transformer and R.167 Track Pack. Production of the TS.676 Set would have been in extremely limited numbers. This is one of the rarest of all the surviving standard sets from this period. For many years it had been very much in doubt whether or not this set was ever actually made. By rights, this set should not exist. In his reference work “The Story of Rovex Volume 2 1965-1971”, from examining the UK company records, Pat Hammond notes that ‘...although 1,000 Murgatroyd’s tanks went to Canada in 1968 there is no record of any being sent in, or before, 1967...’ However, although already dropped from the UK catalogue, 1,100 of the red ICI tanks were made at Margate in 1967; presumably for export. 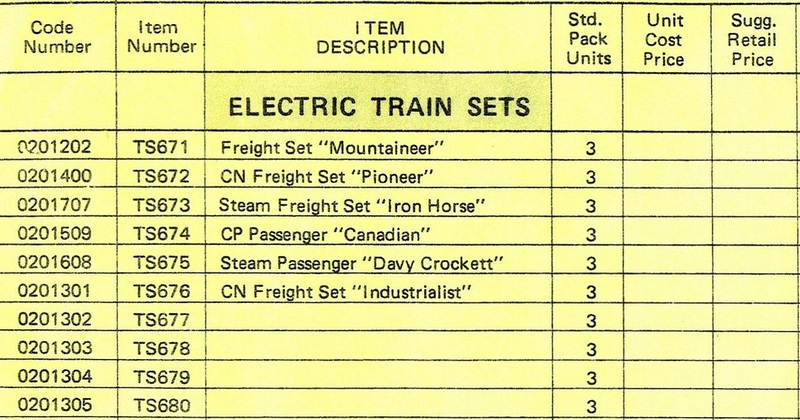 A recent discovery of a duplicated handwritten order form/price list for ‘Obsolete British Railways Locomotives, Freight and Passenger Cars Accessories + Primary Series’ dating from 1965-66 throws some light on this; it shows both tank cars being offered to traders at a discount price in order to clear stocks of the now discontinued BR range for Canada. So, clearly there were already existing stocks of these models in Canada and it would have been possible to assemble the TS.676 sets. 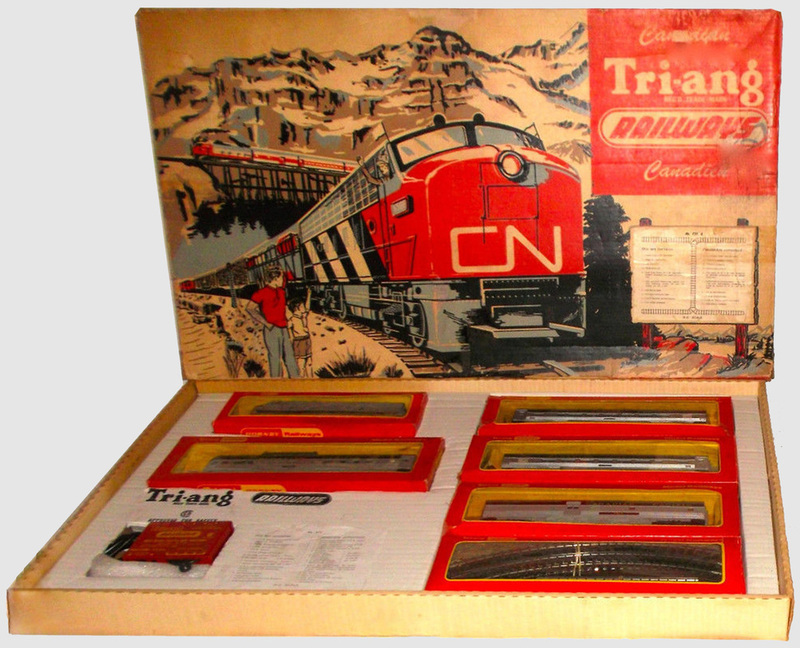 The fact that the set was discontinued by 1968 indicates that it must have been very unpopular with retailers and had received very few orders. 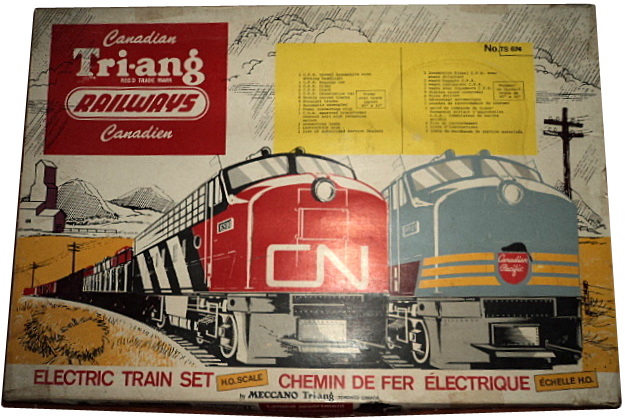 These sets were not illustrated in the 1967/1968 Canadian Catalogue but, rather strangely, were numbered in the Feb. 26, 1968 Tri-ang Railways/Meccano Tri-ang Price List. 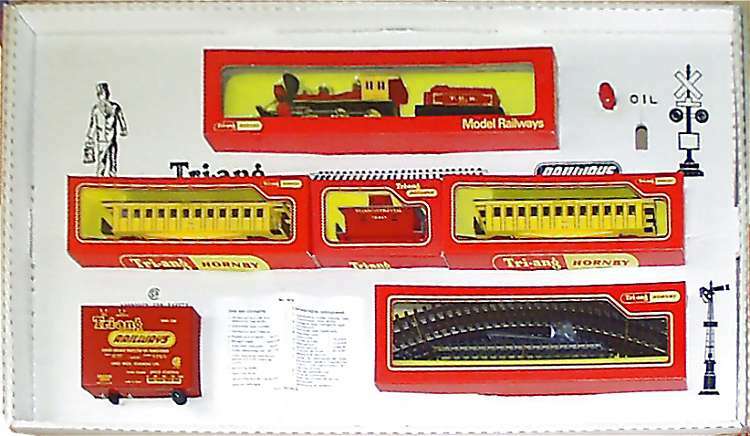 It is had been thought that these sets were never produced, since no set names or any further details were included in the price list and no examples had been discovered to prove that they were made. However, in the light of recent 'discoveries', it is now possible to confirm that sets with the numbers '677' and '678' were made and that it is all but certain that sets with the number '679' were also issued. 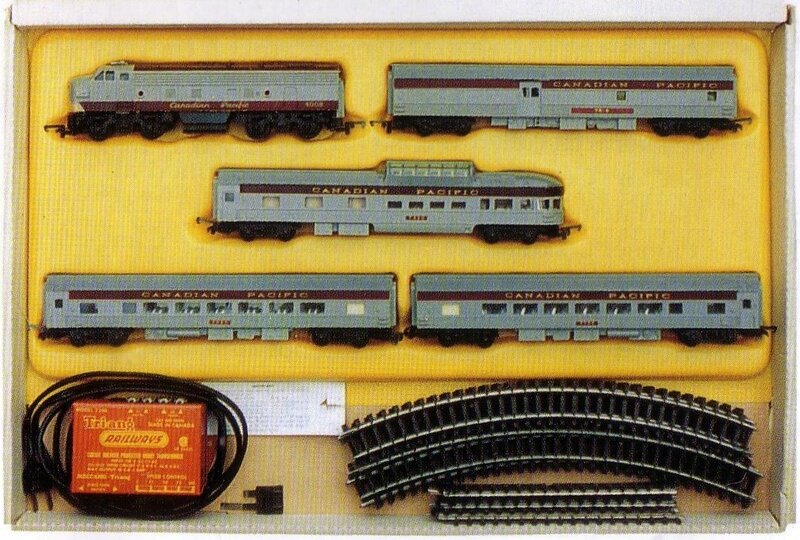 These sets, however, do not appear to be Standard Train Sets but Special Train Sets made for the large department stores and home shopping/mail order catalogue companies. 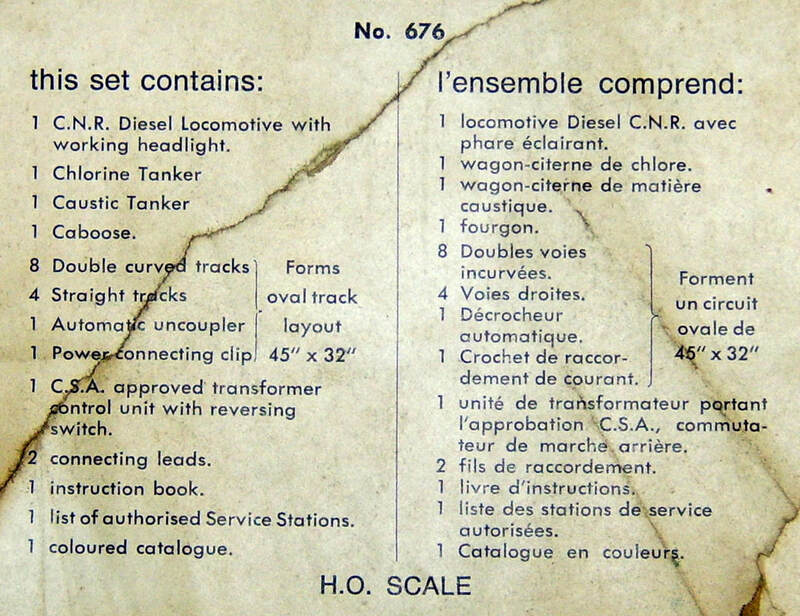 Sets numbered 677 to 679 are now listed in the 'Special Train Sets for 1967 and 1968' section of this website. The set did not appear in the 1967/1968 Canadian Catalogue. 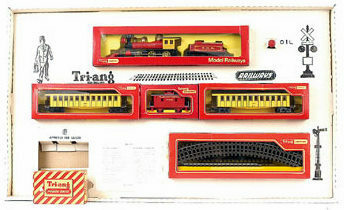 It was numbered in the Feb. 26, 1968 Tri-ang Railways/Meccano Tri-ang Price List but again without a set name or any further details. It was, however, featured in the later May 1, 1968 Roland G. Hornby Price List showing the retail price as being $50.00. The exact contents of this proposed set are unknown but it appears that it would have been composed of a locomotive and seven freight cars. No further details are available and no examples have been found to prove that it was made. Note: In the light of the very recent 'discovery' of a 1968 Special Train Set numbered '680' for Simpsons and Simpsons-Sears, it now appears that the TS.680 Standard Train Set was proposed for release but due to lack of interest and orders from the retail trade it was never released. The number was then utilised for the Simpsons and Simpsons-Sears Set. See the 'Special Train Sets for 1967 and 1968' section of this website.